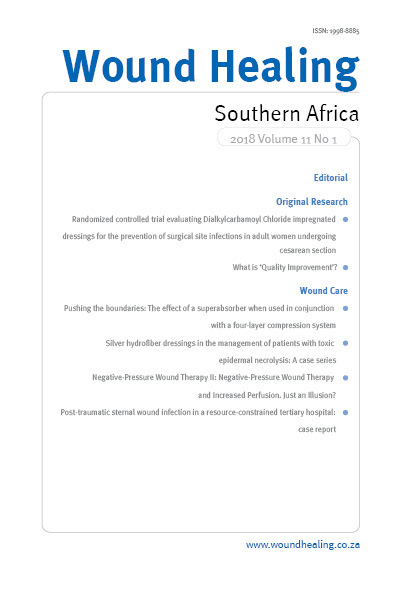 Background: Surgical site infections (SSI) occur in 1.8%–9.2% of women undergoing cesarean section (CS) and lead to greater morbidity rates and increased treatment costs. The aim of the study was to evaluate the efficacy and cost-effectiveness of dialkylcarbamoyl chloride (DACC) impregnated dressings to prevent SSI in women subject to CS. Methods: Randomized, controlled trial was conducted at the Mazovian Bródno Hospital, a tertiary care center performing approximately 1300 deliveries per year, between June 2014 and April 2015. Patients were randomly allocated to receive either DACC impregnated dressing or standard surgical dressing (SSD) following skin closure. In order to analyze cost-effectiveness of the selected dressings in the group of patients who developed SSI, the costs of ambulatory visits, additional hospitalization, nursing care, and systemic antibiotic therapy were assessed. Independent risk factors for SSI were determined by multivariable logistic regression. Results: Five hundred and forty-three women undergoing elective or emergency CS were enrolled. The SSI rates in the DACC and SSD groups were 1.8% and 5.2%, respectively (p = 0.04). The total cost of SSI prophylaxis and treatment was greater in the control group as compared with the study group (5775 EUR vs. 1065 EUR, respectively). Independent risk factors for SSI included higher pre-pregnancy body mass index (adjusted odds ratio [aOR] = 1.08; [95% confidence interval [CI]: 1.0–1.2]; p < 0.05), smoking in pregnancy (aOR = 5.34; [95% CI: 1.6–15.4]; p < 0.01), and SSD application (aOR = 2.94; [95% CI: 1.1–9.3]; p < 0.05). Conclusion: The study confirmed the efficacy and cost-effectiveness of DACC impregnated dressings in SSI prevention among women undergoing CS.